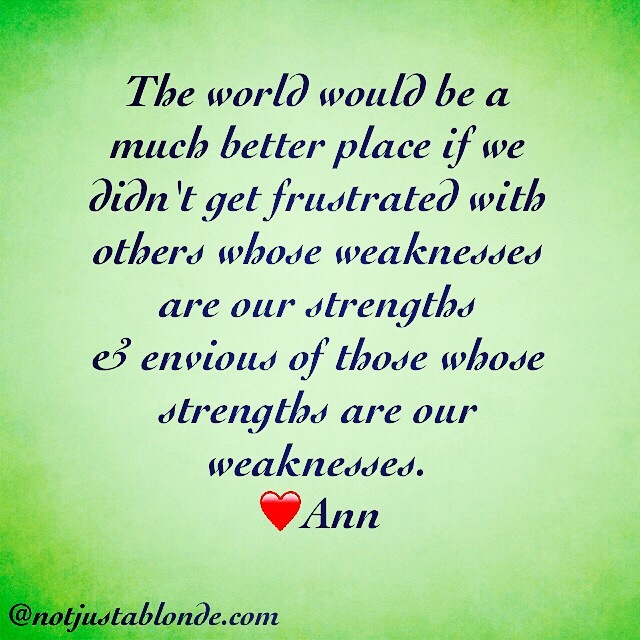 The world would be a much better place if we didn’t get frustrated with others whose weaknesses are our strengths and envious of those whose strengths are our weaknesses. Why must we judge each other so? It is a known fact that not one of us is perfect and yet we moan and complain when confronted with the imperfections of others! We might all be happier if we come to terms with the truth that each of us are broken and imperfect. Ironically however, we are equally upset if we perceive that others possess characteristics that we ourselves desire yet do not have! Jealousy sneaks into our hearts and robs us of peace. We feel threatened and less valuable when faced with the positive qualities of others we might lack. We feel like ‘less’ because others appear to have ‘more’. A better world begins when we remember that every single one of us has special gifts and a unique purpose. My strength may fulfill your weakness as your strength compensates for my lack. When we combine our own strengths and our gifts with those of others this is how we accomplish great things! These great things cannot be achieved if we use our energies for envy and complaints. The world would indeed be a much better place if we accepted each other more and criticized each other less. By building each other up through encouragement, patience and forgiveness the world will become the better place we dream of and the one God Himself desires for us! Thank you very much! I will check it out.